Ahead, a memorable evening of preparing French dishes and becoming enlightened with a diverse range of French wines to compliment. 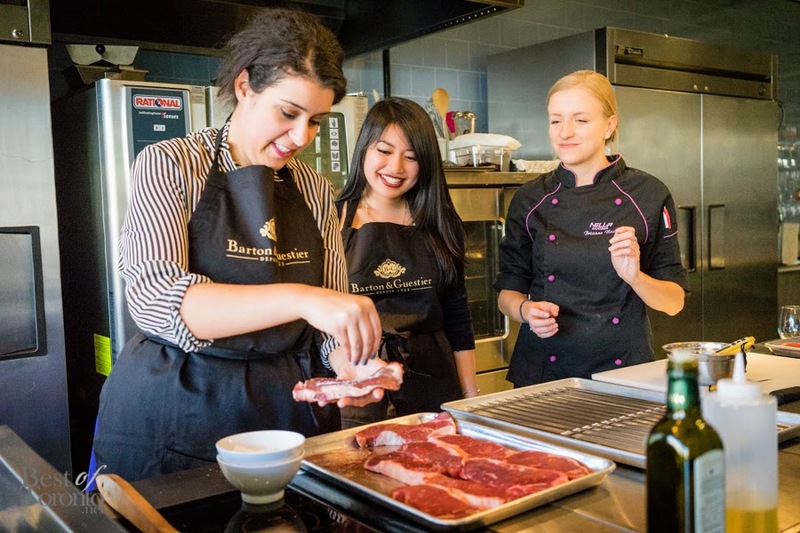 We were able to discover the beauty of Barton & Guestier, the number one wine brand name of France, and further to partake in a hands-on cooking class. The evening was taken place at Nella Cucina, home to The Annex. Upon entry of Nella Cucina. you are first welcomed by their retail front, then led up the stairs to where their regular cooking classes take place. The first glass I was presented with upon arrival was the B & G Passporte Bordeaux Blanc, it was crisp and held a light and fruity aroma. Mingling away, we observed the bustle of Chopped Canada winner, Brianne Nash and her team hastily working away to present the two hors d’oeuvres to pair to our wines: Shrimps laid in a light Chili-oil, and the second was a sliced Crostini topped with Ricotta, wine-infused carmelized Onions and Fig. As soon as we were settled and seated, Clementine Quereax – Barton & Guestier’s Export Manager and Global Brand Ambassador sweetly welcomed and presented us to our new acquaintances: her pride and joy, the wines that we were to discover to be infused into our dishes and by side as pairings throughout the evening. In the next stage, we were set into three groups: one in charge of assembling the salad, the second for the main and the third working on the side dish. I was set into the preparation for our main, a Grilled New York Striploin. I’ll admit that before a month ago, I had a very low appreciation, and subsequently, a stubborn lack of knowledge of steak. I mean, come on, I thought that J’s Kitchen in Sydney was sickeningly amazing. So, provided with all of the relief of winging it, we were completely guided by the expertise of Nash. I was truly mind-blown by the simplicity of it all: Nash first taught us how to gauge the level of doneness of our steaks by pressing the fleshy part of our palms and comparing it to the meat on the grill; this step could otherwise be beautifully accurately achieved with a meat thermometer, gauging at 120 degrees for medium rare perfection – the latter is my preference. The New York Striploins that we were all very happily experimenting with were supplied by Beretta Farms – Nash pridefully and excitedly expressed to us that these Striploins are absolutely organic and hormone-free, she confidently said that we will truly be able to taste the difference. Our group rotated in practicing our method in seasoning the meats and tossing it on the grill, rotating at 45 degrees, and flipping it, repeating the process to achieve the consistent, and admirable, ‘diamond’ crosses throughout. We were then advised of the importance of resting the freshly grilled the meats on an elevated rack to halt the meat from further cooking and enable the meat to breath (just, genius). She brought up a great range of pointers, I was two-thirds convinced that this Steak would be delicious. I certainly enjoyed how hands-on it was and the amount of great tips Nash shared. With all of the knowledge we were taking it, it only made me curious of what the other two teams absorbed! Nash went on to demonstrate the creation of the ‘jus’ wine reduction, created using one bottle of B & G Partager La Gardie Cabernet Sauvignon, a roughly sliced Shallot, sprig of Rosemary and Butter. Freshly coated side of truffle-roasted Fingerling Potatoes ready for the oven! We wandered into the set dining room to prepare for the indulgence of our creations. While we were receiving our first wine pairing and settling in, Quereux began with an introduction of Barton & Guestier and it’s great background: founded in 1725, it is the oldest wine merchant in Bordeaux, France. Before each of the courses made it’s way around, Quereux passionately spoke of the vineyard the grapes derived from, visually detailing the beautiful area, the process of it’s creation, our expected tasting notes, it’s most suitable pairings and why they fit so well. The first to arrive was the very vibrant, Beet, Fennel & Apple salad with a Honey-Mustard dressing made by our fellow attendees. This salad was paired with a sweet-scented and medium-bodied B & G Partager La Gardie Merlot ($9.95, LCBO). This wine was a fine complement to the crisp and tart elements of the salad. The second course made it’s way around and it was out of the waters of what I anticipated. The NY Striploin was juicy, well-seasoned, and beautifully complimented with the addition of Blue Cheese sauce. I may be biased because it was our own creation, but, I can easily say that it was the best piece of grilled steak that I have ever devoured. The sides of glazed Green Beans and Truffle-roasted Fingerling Potatoes were also two wonderful complements to the dish that I wish to replicate on my own in the future. The wine pairing for this dish was their medium-bodied, blackcurrant scented B & G Partager La Gardie Cabernet Sauvignon ($9.95, LCBO), this was a double pure kill – the same wine is used in the reduction swirled around our medium rare sirloins, altogether, this wine provided a rich depth and truly elevated the flavours. The two dishes we’ve prepared in a team effort and by the wonderful guidance of the Nella Cucina team were fantastic. To conclude the experience, we were presented with a Dark Chocolate Brownie served with a Sour Cherry Compote. Completely created by the Nella Cucina team, this was paired with the B & G Les Charmes De Magnol Medoc ($18.95, LCBO), it is a lovely blend of Cabernet Sauvignon and Merlot. Full-bodied, it is a smooth, lightly spicy and wonderfully bold wine filled with distinctive scents of blackcurrant – without a doubt, my favorite of the night. Barton & Guestier hosted an interactive evening of learning how to cook French cuisine and the importance of savouring wine along side. Each attendee had a memorable experience by the fine guidance of Chef Brianne Nash and the Nella Cucina Team. Great thanks to Clementine Quereux and Barton & Guestier, along with Butter PR for hosting and executing this wonderful event.